This week, America will celebrate the holiday of Thanksgiving—a day set aside to be grateful for everything from family to food to faith. While people celebrate in different ways, the point of the holiday is to stop for one day and reflect on the abundant blessings we have. It’s also the official kick-off to the holiday season, and not just because of the calendar. Thanksgiving and Christmas go hand in hand for a deeper reason. You see, gratitude and generosity go together because a heart that understands and appreciates its blessings is more apt to be a blessing to someone else. As I’ve thought about it, there are three steps that lead a person to generosity. They’re not exhaustive, of course, but they’re worth thinking about as you take time to consider your blessings this holiday season. This may seem like an odd place to start, but for me, it’s where everything begins. As a person of faith, I believe that everything I have comes from my relationship with God. While I do my best to be a good person, I know that I’m not perfect, which means that the blessings God sends my way are the result of His generous heart.The fact that I can’t earn God’s favor—He gives it simply because He loves me—keeps me humble. While I’m proud of the things I’ve accomplished in my life, I must acknowledge that God is the true source of my success. Even if you’re not a person of faith, you’ve still been the recipient of grace—just ask your spouse or a coworker! We all have benefited from someone who was willing to let a mistake, or a fault go and when we can acknowledge that truth, we open ourselves up to gratitude. Being grateful shouldn’t be confined to a single day. I recently spent time with Rachel Hollis, a writer and speaker, and she shared her practice of writing down things she’s grateful for daily. 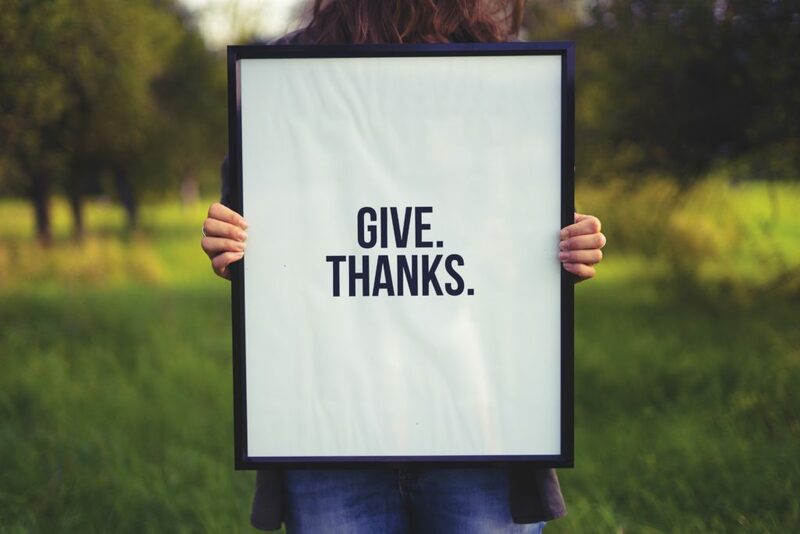 No matter how stressful or chaotic her day might turn out to be, Rachel is committed to finding something positive for which she can be thankful.You might not practice a gratitude journal like Rachel, but you can still make gratitude a part of your everyday practice. It doesn’t take much time to say thank you to someone who helped you or spend a moment in appreciative reflection. It simply takes a heart and mind committed to gratitude. When we can see and appreciate the grace we receive, the next natural step is to be gracious towards others.Generosity is our willingness to extend help to those around us. While the holiday season is often characterized by physical gifts, there are several ways we can be generous to the people we encounter without ever spending a dime. We can be generous with our time. We can be generous with our praise. We can be generous with forgiveness, patience, and compassion. We can be generous with our wisdom and insight. Our capacity for generosity is limited only by our desire to give. This week, wherever you find yourself, take a moment to pause and reflect about the good things you have in your life. Though some of us may find ourselves in the middle of difficult seasons, there is always a reason to be grateful. We just have to stop and take a moment to realize it. I’m grateful Sir John C Maxwell for your good works. Wow, what a wonderful way of thinking about this. I’m from Denmark and Thanksgiving is not something we celebrate, but I have always felt that this season was about being thankful and about sharing. Thank you. Thank you sir for this and other numerous life changing teachings you have made in my life. Happy Thanksgiving Dr John. Your mentorship these past 13 years have positively impacted my personal life and ministry. Honest! And you are part of my success as I do mission work and pastoral ministry. Immensely grateful for you sir! John, my friend I fear that even with all the accolades you have received you/we will never be able to appreciate the enormity of the impact you have had…are having..and will have on the lives of so many people. The simple application of the 3 G’s you outlined above, at no real cost to ourselves except a little time, can be life changing to someone else. May we all take a little time this Thanksgiving season to positively impact another. No better way to say thanks to you! Many in our culture has had such loss& being grateful means say a prayer for them. Loss makes everyone dig deeper to see how much they have. Had loss this year, remember what you have in your heart to give others is more important than money, you have words that can heal, bring hope, cause forgiveness. Certify yourself the healer for the world, get about your work, God is watching. Did you know you can change lives with your mouth. Johns right, gratitude from you to others makes life much different for everyone. I’m grateful for your Godly leadership. I woke up early this morning knowing I needed to ready your email. Thank you for being a strong leader and coaching me along in my journey. Looking at 2015 Thanksgiving Challenge of Standing on the Shoulders of Giants was very well written and encouraged me to write to my former corporate of work where I believe was the most rewarding career. In our Mastermind meetings at my current job, all of your writing material was actively performed daily with the world’s greatest leaders being mentored around me daily in my previous corporate career and I thrived in that culture and leadership environment. I am so grateful to AE corporate, their culture, their executives, and their leaders for believing in me and making me the best.